My journey to the Solomon Islands began with an exciting dive experience and an unforgettable taste of history. Passing 100ft (30m) on my way down to 170ft (52m), I began to question the intelligence of this decision. I was in a very remote corner of the globe, with minimal surface support, dropping to a very deep depth and all on a single tank of air. The plan was simple, descend down the sloping coral reef until we hit the seabed, spend six to seven minutes on the bottom and then begin the slow ascent back to the surface, punctuated by 25 plus minutes of decompression stops. The temptation drawing me to the ocean floor was a somewhat newly discovered and nearly fully intact WWII Corsair fighter plane sitting upright in the sand. Circling her with my camera, I concentrated on controlling my breathing and composing photos, all the while contemplating the ill-fated young US pilot who likely perished when this plane went down. The Corsair had been found just 15 years earlier when freedivers, spearfishing off the point, spotted the plane on the bottom. Due to the exposed nature of the dive site, the depth at which she sits, and the level of experience needed to dive her, only a handful of people have had the privilege to visit the Corsair each year since her discovery. Back on dry land, I marveled at the wreckage left behind after the war and contemplated the fact that even now, 75 years later, hundreds of planes are still waiting to be discovered. I should probably start off with a confession: The Solomon Islands have held a fascination for me since I was a teenager. I spent my adolescent years researching book reports on the Pacific Theater during the Second World War and knew of the Battle of Guadalcanal and John F. Kennedy’s ordeal on PT-109 long before I fully grasped that they occurred in the Solomons. It took the prospect of my recent trip to bring all of the puzzle pieces together and rekindle my enthusiasm to see these childhood curiosities in person. The year 2017 marked the 75th anniversary of the 7 August 1942 invasion that started the Battle of Guadalcanal, the first major allied offensive against the Empire of Japan during World War II. Code-named Operation Watchtower, the campaign began with attacks against Japanese held installations on Guadalcanal, Tulagi and Florida islands. The objective was to keep the Japanese from using these bases and airfields to threaten communication and supply routes between the United States, New Zealand and Australia. Over the course of six months, the allied and Japanese forces squared off in three key land battles, seven extensive naval battles and near continual aerial assaults, leading to the eventual withdrawal of the remaining Japanese forces in February 1943. Tens of thousands of men were killed or wounded, dozens of ships destroyed and hundreds of planes lost during the struggle to retake the Solomon Islands. Allied troops eventually seized the seaplane base at Tulagi, along with the Japanese built airstrip on Guadalcanal, which later became known as Henderson Field, and currently serves as the nation’s principle international airport, plus the Japanese-built airstrip at Munda, which now welcomes daily interisland flights from Honiara and Gizo. Control of these airstrips was essential in stopping the Japanese advancement across the Pacific and I was fortunate to explore all of these places and more during my visit. New Georgia Island and the settlement of Munda was the first stop on my tour of the Solomon Islands. Located in the Western Province, at the edge of Roviana Lagoon, this quaint waterside town is walking distance from the contested airstrip that brought allied troops here 75 years ago. Consisting of a few storefronts, a couple of hotels, a nightclub, a dive shop and the town pier, life passes relatively slowly here. The restaurant at my hotel had views of the ocean from every table and provided an assortment of delectable cuisine, as well as my new favorite drink, bush lime juice. Hand squeezed from tiny limes, the resulting beverage is tart, sweet and refreshingly indulgent. Munda is a bit rustic by typical American travelers standards and definitely off the beaten path; however, for those looking for a little adventure, especially divers wanting to experience untouched wilderness, mixed with amazing WWII history, this is the place to be. The diving around Munda offers a wide variety of exceptional options including colorful coral reefs, sheer walls, schooling pelagics and WWII wrecks. The remote nature of this area equates to a limited number of divers, zero competition for dive sites and healthy, pristine reefs. Visibility can vary within the bays and shallow lagoons but is often in the 60 to 100ft (18 to 30m) range on the outer reefs and most dive sites are only a 10- to 20-minute boat ride from shore. Alice in Wonderland. I thoroughly enjoyed diving on the reefs amongst fields of mushroom leather corals, enormous carpet anemones and shallow hard coral gardens. Although my favorite find was at a dive site called Alice in Wonderland, where we came across an expanse of the largest plate corals I have ever seen. Measuring 10 to 15ft (3 to 5m) across, the sea floor was literally covered with these massive disks. The scale of these formations was simply astounding, as is the notion that it likely took well over a hundred years for each of these coral colonies to amass their enormity. Grunman F4F Wildcat. Next to Alice in Wonderland is a Grunman F4F Wildcat fighter plane resting upside down in 40ft (12m) of water. 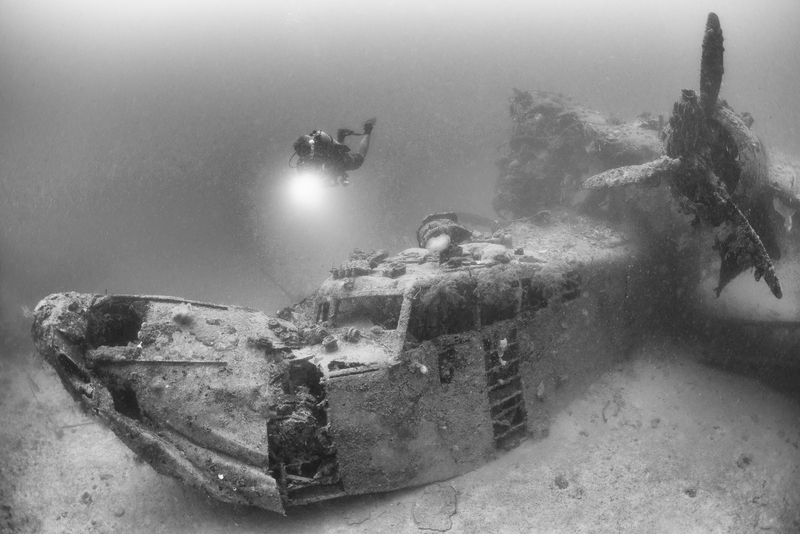 Shot down on 4 August 1943, the Wildcat is now fully entwined with the surrounding reef. Schools of glassfish and golden sweepers call it home, as they dance around the fuselage and landing gear encrusted with colorful corals and sponges. I dove on four different plane wrecks while in Munda but this was the only one that had been reclaimed by the reef. The other three, including the Corsair, a Bell P-39 Airacobra and a Douglas A-24 Banshee dive-bomber landed upright in the sand and are still easily identified as their former selves. In between dives on the Airocobra and the Douglas bomber, I was fortunate to photograph and interact with a group of local children playing along the shoreline. Several young boys were using an arching palm tree as a make shift trampoline, grasping on to the trunk as they bounced up and down before catapulting themselves into the shallow water. The children were hesitant when I first approached but as soon as I was able to convey my intentions, by showing them photos on the back of the camera, playtime resumed. It was such a fun and memorable experience to be accepted into their midst and share in the universal joys of childhood. Nearby to the final resting place of the Airocobra is the island of Lumbaria, where John F. Kennedy and the US Navy’s Patrol Torpedo (PT) boats were stationed during the war. Though different from the now famously named Kennedy Island, where JFK was stranded after a Japanese destroyer struck and eventually sank his PT-109 boat, I was still a thrilled to witness yet another small part of the history I had studied in my youth. Kashi Maru. Mbaeroko Bay is situated on the northern coast of New Georgia Island, nearly opposite of Munda, and is home to the wreck of a Japanese supply ship named Kashi Maru. A US B-25 bomber sank her on July 2, 1943, while she was offloading fuel and vehicles under an artificial canopy of palm trees, constructed to camouflage the ships existence. The wreck now rests upright, leaning slightly to port, in 40ft (12m) of water alongside the sandy, sloping bank, with remnants of the cargo still in the hold. Truck axels, tires, ammunition and spools of wire can be seen through the gaping hole in the port side that was peeled open by the bomb responsible for her demise. The engine room, just aft of the cargo hold, is fully intact and well preserved for those with the experience and skill to penetrate the small space. This beautiful shallow wreck can provide hours of fascinating discoveries, though the brackish water in the bay can at times lead to challenging visibility. No visit to the Kashi Maru is complete without a boat ride along the nearby shoreline to view the four Japanese anti-aircraft guns once used to protect this supply depot. These massive cannons now sit idle, in rusting disrepair, slowly being reclaimed by the surrounding jungle. Similar relics from the war exist in other places on the island, including mass dumping grounds where departing troops, both Japanese and American, buried everything from weapons and ammunition to trucks and airplane parts. Up in the hills overlooking Munda, one man has organized thousands of found objects into the town’s only museum. The artifacts are neatly displayed in a covered open-air facility, on rows of tables with supporting documentation, labels and historic photos. The Peter Joseph WWII Museum is named after the US soldier whose dog tag first started the collection. It has now grown to include hand grenades, knives, bullets, shells, mortars, guns, helmets, canteens, lighters, buckles, cups, bowls, bottles, silverware, rotary telephones, engines, propellers and much, much more. On my way to the museum, I was lucky to ride in an almost fully restored 1942 Jeep Willy as we toured the surrounding hillsides, utilizing roads originally cut through the jungle by allied troops. Believed to be the only functioning WWII Jeep in the Solomons, should you get the opportunity, this once in a lifetime brush with history is not to be missed. Across the lagoon to the west of Munda sits a small palm tree covered patch of land called Skull Island. Locals have built a shrine on this sacred spot to honor their past chiefs and many still journey to the alter asking for their blessings. The skulls of former chiefs adorn the shrine, along with shell money and other offerings for good fortune. While still in use today, the last chief laid to rest here died in 1932. There are many places around the islands for the non-diver and outdoor enthusiast to explore this tropical wonderland. For avian fans, the Solomon Islands also offer world-class birding opportunities. Several islands provide hiking or trekking tours, including Kolombangara and Tetepare, which are within a one to two-hour boat ride from Munda. Tetepare is the largest uninhabited island in the south Pacific and is home to several endemic species of birds and bats, plus monitor lizards, tree snakes, dugongs, sea turtles, saltwater crocodiles and a resident pod of dolphins. Over 230 species of birds have been documented on Tetepare, 24 distinct reptiles, 4 frogs and 13 species of mammals. After a week-long stay in Munda, I took a short one-hour flight back to Honiara, the capital city on Guadalcanal Island, before boarding a new liveaboard dive boat for a 10-day cruise dubbed the Best of the Solomons. The first stop on the itinerary, after an overnight transit, was a place called White Beach in the Russell Islands. Once home to a supply depot for allied troops during WWII, evidence of its topside existence has largely been erased over time; however, under the water, a huge collection of artifacts remain, scattered down a sloping coral wall. As in Munda, large amounts of supplies and gear were left behind at the end of the war and in this instance nearly all of it was pushed into the sea. The floating barges used to offload supplies were intentionally sunk, as were tanks, trucks, tractors, fork lifts, ammunition, provisions and more. The resulting wreckage still echoes its previous life form, though it is far more colorful today, thanks to years of coral and sponge growth. White Beach. White Beach was the only site where I encountered WWII relics in the Russell Islands, though I am certain more exist. Our remaining three days of diving in the area focused on shallow hard coral gardens, sheer walls, coral bommies, schooling fish, incredible caverns and huge sea fans. Here, I also learned to be on the lookout for geckos, the name affectionately used by the local dive masters for saltwater crocodiles. In areas where they are known to linger our guide carried out recon missions ahead of my dive to be sure none were laying in wait. Sadly, none of the missions were successful and I did not get to see any geckos on our trip. Bat Cave. However, upon surfacing inside a cavern at a dive site named Bat Cave, I did get to see hundreds of bats roosting on tree branches overhead. Just outside the cave entrance, I photographed the smallest critter found on this trip: a Denise’s pigmy seahorse. Blue Wall. Contrast the half-inch (1cm) long seahorse to the massive 15+ ft (5m) wide sea fans at a dive site called Blue Wall, and the Russell Islands delivered the biggest span of life I encountered underwater. Mirror Pond. Should Mother Nature and the dive schedule cooperate, there are spectacular photo opportunities at two world-renowned dive sites in the Russell Islands. Both require bright sunshine throughout a small window of time during which light rays may stream into cavernous spaces. The first is called Mirror Pond and this actual pond of seawater lies in the jungle surrounded by trees. Divers enter from below, through an underwater cavern, to see a mirror like reflection in the water’s surface with sunrays streaking in from above. Exhalation bubbles quickly ripple the mirror effect so photographically it is best to be the first one inside or wait for everyone else to pass and try your luck at the back of the pack. Leru Cut. Leru Cut is the other site, and it consists of a natural gash in the rock at the edge of Leru Island that is 10 to 15ft (3 to 5m) wide, 30 to 40ft (9 to 12m) deep and stretches 300 to 400ft (92 to 122m) into the island, with trees forming a canopy overhead. Here again, it is best to be first in line with a camera, so you can swim inside and look back out the opening to silhouette incoming divers against the blue water and streaks of light. I did not have great luck at either of these sites with conditions or time of day and look forward to improving my images the next go around. From the Russell Islands, I took a northwesterly heading on a long overnight transit to Marovo Lagoon. The next morning, I discovered that this saltwater lagoon is absolutely massive, encompassing 270 sq mi (700 sq km), and is protected by an impressive double barrier reef. Skilled fishermen inhabit numerous islands within the lagoon, as do some of the most talented wood carvers I have encountered during my travels. Several members of our boat crew grew up in this area, and we were fortunate to visit one of their homes while on a tour of Peava Village on Gatokae Island. The resident children lined the beach awaiting our arrival and excitedly led us on a procession to tour their schoolhouse. Once inside, the kids welcomed us with a series of songs before we presented their teacher with a collection of school supplies and made lots of new friends when a bag of lollypops materialized. A few of the kids posed for portraits for me and I loved seeing their smiling faces light up upon observing themselves in the camera. Back down along the shoreline several artists had laid out their woodcarvings in a makeshift market, and we were left with the difficult task of choosing between all of their magnificent work. With zero space or weight left in my bags, I was lucky the large pockets in my jacket allowed me to bring home stunning carvings of both an octopus and a cuttlefish to add to my collection. Underwater the scenery in the lagoon was every bit as impressive as the aquatic woodcarvings. I dived on multiple shallow coral gardens, each teaming with fish and several species of soft corals, many new to me, tucked in amongst branching corals, sponges and algae. There were vast fields of staghorn and elkhorn corals and monstrous sea fans every bit as enormous as those found in the Russell Islands. I shot one of my favorite critters, the crocodile flathead fish, on three separate occasions, and once with the proper lens combination to capture simply its eye. Cathedral. At a dive site named Cathedral, I swam through another vast cavern with amazing shafts of light, this one with multiple chambers and openings to the jungle above. I was also able to finally photograph the endemic white-bonnet anemonefish. Existing only in the Solomon Islands and Papua New Guinea, this cute little clownfish had eluded me for 12 years since I first discovered it in Papua New Guinea. I was shooting film at the time and had already exposed my 36 frames when I saw a white-bonnet under the boat during my safety stop. Surfacing to change tanks and reload my camera, I begged the captain to stay for one more dive, but the weather had turned and sadly he needed to get us off the reef; I never got another opportunity. From Marovo Lagoon, we circled back through the Russell Islands and then made our way northeast up to the Florida Islands, also known as the Nggela Islands. This island group lies directly north of Guadalcanal and consists of four larger islands and roughly 50 smaller ones. The first day in the Florida Islands, we were diving reefs and several beautiful walls with large sea fans, black corals, barrel and elephant ear sponges and a huge field of staghorn corals. There was also a large dome of encrusting corals, colonies of red whip corals and a mammoth aggregation of glassfish and golden sweepers. Baby Cakes. At a pinnacle named Baby Cakes, we made a night dive and found several scorpionfish, two different species of lionfish, nudibranchs, hermit crabs and a colorful spider crab wandering across a sea fan. Tulagi Island, a smaller one, is the current capital of the Central Province and was home to the British Administration of the Solomon Islands prior to WWII. Nearby to Tulagi, in a pre-dawn surprise attack on 7 August 1942, US Navy aircraft bombed the Japanese seaplane base at Gavutu Island. The assault resulted in the sinking of seven Japanese H6K Mavis flying boats, which were anchored to their mooring buoys in the harbor. Over the next 48 hours, US Marines landed on the island and took control of the base, capturing several wrecked seaplanes in the process and ultimately defeating the Japanese soldiers. I spent the last two days of my trip diving the numerous planes and ships that were sunk in the battles around Tulagi. The Mavis seaplane was originally 84ft (26m) long and stood 20ft (6m) high with a wingspan of 131ft (40m). She was powered by four wing-mounted, 1000 HP, propeller driven engines that delivered a cruising speed of 138 mph (216 km/h) for a range of 4,112 miles (6,580km) at a maximum altitude of 31,520ft (9,610m). A crew of nine managed her payload consisting of either torpedoes or bombs, as well as her four separate machine guns and a 20mm cannon in the tail turret. M5 and M6 Mavis. Several of the seaplanes that were sunk on 7 August 1942, have been discovered in the past two decades. We were able to dive on the Mavis wrecks designated M5 and M6, both of which are sitting upright on a silt and sandy bottom in roughly 100ft (30m) of water. The M5 is largely intact except for a portion of the starboard wing, which is missing. The port side wing, with its engines still attached, remains connected to the fuselage and is supported by the float at its wingtip. The nose of the fuselage is bent upwards, likely from the initial impact with the seafloor, but the cockpit is surprisingly well preserved. The M6 Mavis broke in half as she sunk with the tail section now nearly facing forward and both wings folded upside down, each on the opposite side to where they were originally attached. The destruction also opened up the rear of the cockpit allowing divers the opportunity to swim inside to see what is left of the metal framework of the seats and the pilot’s controls. Visibility in the bay can deteriorate quickly, with runoff from recent rains, tidal flow and divers with poor buoyancy control. Our 30 to 40ft (9 to 12m) of visibility on the M5 dropped down to 5 to 10ft (2 to 3m) the next day on the M6, though we had a lot of particulate matter in the water both days. US PBY-5A Catalina. In between the Mavis wrecks, I also dived on a US PBY-5A Catalina seaplane. Similar in function to the Japanese Mavis, the American built Catalina was supported by a crew of 10 on a platform, which was slightly shorter in length and wingspan, had only two wing-mounted engines and a considerably reduced range and altitude capability. The wreck sits upright, nearly fully intact in 110ft (34m) of water. Both engines have fallen from their mounts and are lying beside the fuselage with their propellers stuck in the sand. A large gaping hole behind the wing mount was potentially the cause of her sinking or was simply ripped open when the plane hit bottom. The machine gun once used by the waist gunner has tumbled to the seafloor though its ammunition is still waiting to be fired next to the gun mount. While you are exploring the wreck be on the look out for an immense school of glassfish that now call the port side wing home and the assorted resident lionfish living in the cockpit. HMNZS Moa. The deepest shipwreck I explored was a Bird class minesweeper of the Royal New Zealand Navy that was bombed by Japanese aircraft in Tulagi Harbor on 7 April 1943. The top deck of the HMNZS Moa (T233) rests at 130ft (40m). Very early one overcast morning, I was swimming across her bow towards the forward gun in negligible visibility. It was so dark and green down there that my camera had trouble finding focus and shooting at f/2.8 for 1/30 of a second, I still needed to raise my ISO to 3200 to get a decent exposure. After photographing the gun, my dive guide and I navigated from bow to stern to shoot the gigantic winch mounted to the back deck that was once used in minesweeping operations. With our bottom time expiring, we returned to the mooring line to begin our slow ascent back into the light. After our final dive, which happened to be on the Mavis M6, we motored back to Guadalcanal and anchored in Honiara Harbor prior to disembarking the following morning. Allied sailors named the body of water in between the Florida Islands and Guadalcanal Island the Iron Bottom Sound for the dozens of ships and planes, both allied and Japanese, which were sunk there during the Battle of Guadalcanal. Many of the battleships, cruisers, destroyers, submarines and transport ships rest at depths beyond what can be safely attained by recreational divers, but there are a number of wrecks that lay in shallow water and are accessible by shore or by boat from Guadalcanal. I did not get the opportunity to dive any of these wrecks during my stay on the liveaboard; however, day trips are available from a few local operators if you would like to extend your dive trip. Honiara. Traveling to the Solomon Islands from the United States, I stopped in Fiji for a few hours before catching a Solomon Airlines flight to Honiara. On the way home, I took the same path in reverse. Since the airline only flies to and from Fiji on Tuesdays and Saturdays, I still had roughly two days to explore Guadalcanal after getting off the boat before my flight home. During that time, I visited the Honiara Central Market, two WWII Museums and the US War Memorial. The Central Market is located on the waters of Iron Bottom Sound in the heart of Honiara and offers fresh fish, flowers, fruits, vegetables and local crafts. The fish is carried directly from the fishing boats at the docks to the vendors in the market and is coveted for its freshness. Local merchants come from neighboring islands to sell their produce and handiwork, and often stay for extended periods of time before returning home. A visit to the market is a spectacle for your senses and a wonderful opportunity to get a taste of the local culture and cuisine. Vilu War Museum. To the west of Honiara, on a random dirt road approximately 45 minutes down the Tandai Highway, is the Vilu War Museum. There is a small insignia announcing your arrival at the main entrance but no road signs to actually get you there from the highway. Through the arched gateway is a jungle setting with large clearings that are filled with anti-aircraft guns, cannons, both a Japanese and American war memorial plaque and numerous WWII airplanes in various states of disrepair and re-assembly. All of the artifacts on display were recovered from the jungles around Guadalcanal and saved from the scrap metal dealers that laid claim to most of the wreckage left behind after the war. If you go, bring your sense of wonder, an appreciation of history, sunscreen and definitely bug spray. Tetere Beach WWII Museum. A little more than an hour in the opposite direction from Honiara is the Tetere Beach WWII Museum. Here, you will find dozens of abandoned LVT AMTRAC amphibious landing craft vehicles that the US troops left behind after using them to get ashore during the initial invasion of Guadalcanal. Seventy-five years of tropical weather and neglect have turned them into rusting shells of their former splendor. Many also now have full-grown banyon trees growing in, around and through them. The museum has a large collection of Coca-Cola bottles left behind after the war. The US military discovered that Japanese submarines were using the trail of floating empty Coke bottles, thrown overboard by US sailors, to sink ships during the war. Their solution to the problem was to instruct Coke to make bottles with thicker glass on the bottom, so they would sink instead of float; both types of bottles are on display at the museum. Guadalcanal American Memorial. The Guadalcanal American Memorial overlooks Honiara Harbor and is perched on top of the first hill occupied by US forces. Dedicated in 1992 on the 50th anniversary of the Allied invasion, large granite slabs memorialize the history, battles and fallen American and allied soldiers lost during the Battle of Guadalcanal. A large star and plaque, at the center of the monument, honor an unknown soldier whose remains were discovered during the excavation of the site. The memorial is a humbling tribute to all who fought and died to liberate the Solomon Islands. As a guest of the Solomon Islands Visitors Bureau, I had the pleasure of touring this beautiful country with one of their representatives. Ellison Kyere was wonderful company throughout my trip and incredibly valuable in coordinating local flights and excursions. The remote and rustic nature of the Solomon Islands is one of its biggest draws, especially for divers, but that factor can also make it a bit of a challenge to navigate. Having a local expert to pave the way was a tremendous help. The Solomon Islands has to rank among my favorite dive destinations. The ability to experience even some of the WWII history that fascinated me in my youth was absolutely magical. Add in the unspoiled and untouched reefs with their diverse coral formations, gigantic sea fans, colossal plate corals, the wide-ranging assortment of critters and fish life, and you have an exceptional and rare combination. I look forward to exploring more of this extraordinary country and hope you get the opportunity to travel here soon as well. Bring your sense of adventure and prepare to be amazed. The author would like to thank the Solomon Islands Visitors Bureau (visitsolomons.com.sb), Dive Munda (mundadive.com), Solomon Islands Dive Expeditions (solomonsdiving.com) and the Agnes Gateway Hotel (agneshotelsolomon.com) for hosting this adventure. Thanks also goes to Fiji Airways (fijiairways.com) and Solomon Airlines (flysolomons.com) for their help with flights and the Solomon Kitano Mendana Hotel (kitanomendana.com) and the Heritage Park Hotel (heritageparkhotel.com.sb) for lodging in Honiara. Lastly, thanks go to Scubapro (scubapro.com) and Blue Abyss Photo (blueabyssphoto.com) for their assistance with underwater dive and photo gear. Matthew Meier is a professional underwater photographer and travel writer based in San Diego, California. To see more of his work and to order photo prints, please visit: matthewmeierphoto.com.